In the world of green design regenerative is the new sustainable. While the concept of sustainability has pushed industry to be less bad, it ultimately builds upon a linear mindset. On the other hand, the concept of regeneration evokes circular imagery that is in tune with how nature ultimately works. That is, in nature virtually everything is constantly, albeit on different time scales, in a cycle or period of renewal. In its lifetime an atom of carbon could exist in the atmosphere as a greenhouse gas, in the soil bound up in a diamond, or perhaps in a cow as a protein. Regardless of where it came from and where it is going, the carbon atom will retain its elemental properties and be useful. This design for degradation is one of the 12 principles of green chemistry. However, when it comes to manufacturing, the reality is that some of the products we humans use require complex molecules that do not form or degrade via natural processes. In these cases, the optimal scenario is to capture and reuse products’ required inputs and outputs in continuous cycles. This is particularly true for items that may go out of style before their functional life is over. Carpet happens to be one such product. That is, Shaw Industries researched carpet turnover and found that consumers’ choice to update is based on both aesthetics and performance, typically opting for a new style and color every eight to ten years. Accordingly, back in the mid-90s when Shaw Floors decided to expand their existing carpet backing products they focused on using raw materials that could be endlessly recycled without degradation of quality or performance. Following the cradle-to-cradle design protocol as proposed by McDonough & Braungart Design Chemistry (MBDC), Shaw assessed potential ‘ingredients’ for their recyclability, functionality, and their human and environmental safety down to a level of 100 parts per million (ppm). One of the major changes that evolved from such a rigorous evaluation was the replacement of PVC, and their associated phthalates, with polyolefin resins. 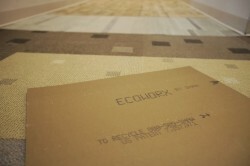 A few years later in 1999 Shaw was ready to introduce EcoWorx backing to their tile line. Even though EcoWorx was not officially MDBC Cradle to Cradle certified until 2007, it did not take long for consumers to catch on to the product’s worth. In fact, David Wilkerson, Corporate Director of Sustainability & Product Stewardship at Shaw, points out that the market responded very favorably to the new product even without a major consumer education effort. By the end of 2003 Ecoworx had reached 70% of Shaw’s carpet tile sales and the company decided to completely phase out their original PVC-based backing, a full two years sooner than was originally planned! That’s great news for Shaw because the environmental benefits of EcoWorx backing increase with sales. That is, while EcoWorx tiles currently contain roughly 44% recycled content, only 5% of it is attributed to old EcoWorx tiles (the other 39% from pre-consumer waste and post-industrial backing). Therefore, the more EcoWorx that completes its lifecycle (i.e. returning to Shaw from corporate facilities, schools, healthcare facilities, and retailers), the more recycled content, and less virgin material, EcoWorx products will have. That doesn’t mean there isn’t already plenty to celebrate. Before EcoWorx was introduced, the separation of backing from fiber was a costly aspect of the carpet recycling process. Now that their backing is polyolefin-based, Shaw can more easily separate it from Nylon 6 through a process known as elutriation. In order to catalyze the recovery and recycling of EcoWorx, all of Shaw’s EcoWorx carpet products come with a Global Environmental Guarantee. What this means is that when customers decide to replace their carpet, all they have to do is call the 800 number on the back of their tile and Shaw will come pick it up. It’s a win-win, as customers free themselves of waste and potential guilt, Shaw recovers valuable feedstock. Fortunately for Shaw’s gas bill (and GHG footprint), since EcoWorx products are 40% lighter than their PVC-based predecessors, they are less energy intensive to transport. Upon pickup the carpet’s first destination is Shaw’s Plant 15 in Cartersville, Georgia, where the tiles are shredded and polyolefin backing is separated from the Nylon 6 face fibers. The polyolefin is then made into pellets to eventually become new EcoWorx backing and the Nylon-6 face fibers move onwards to Shaw’s Evergreen recycling plant in Augusta, Georgia where approximately 100 million pounds of post-consumer Nylon 6 carpet are recycled per year. To commend Shaw for their trailblazing effort with EcoWorx, in 2003 the U.S. Environmental Protection Agency (EPA) awarded them the Presidential Green Chemistry Challenge Award. However, EcoWorx is only the beginning; 60% of Shaw’s current sales are being generated by products that are Cradle to Cradle certified. With that said, when it comes to regenerative design, as the largest recycler of post consumer carpet in the world, Shaw is certainly a leader to be admired. However, they are not the only carpet company rethinking their approach to product design and recovery. Stay tuned as CARE continues to highlight innovation and excellence across the industry! Carpet recycling is on the rise here in the United States! Last year, 10% of the nation’s carpet waste was diverted from landfills and much of that was recycled into high-value materials. But what about carpet waste in other parts of the world? The United Kingdom lacks a local facility for processing polymer fibers and their carpet waste mostly consists of polypropylene-based fibers, which both act to limit the capacity for recycling recovered carpet. Despite this, an impressive 21.4% of the nation’s carpet waste was diverted from landfill in 2012, which represents a 10-fold increase since 2008. Of the diverted waste, 58% was used for energy recovery in cement kilns, 34% was downcycled for use in equestrian surfaces, and the remaining 8% was recycled or reused. CARE was happy to offer advice to Carpet Recycling UK while they were getting underway and their progress is impressive. Carpets have been banned from landfill in Germany since 2005 and are now banned across the European Union. While a large nylon-6 recycling plant operated in Germany from 2000-2002, it closed due to a lack of raw materials. Without any major facilities for polymer recovery operating, much of the carpet waste in the EU is either burned in cement kilns or incinerated. Desso, a Netherlands-based carpet manufacturer, is now piloting its Refinity recycling process for cradle-to-cradle reuse of carpet tiles. Canada has a small carpet recycling program, but is challenged by its widely dispersed population. Because the face fiber represents the majority of the value in recycled carpet but only a fraction of the weight, population density factors heavily in the viability of the carpet recycling. A small number of carpet collection facilities are operating in Canada, but are too far from recycling facilities in the US to effectively ship materials. Most of Australia’s carpet waste is currently being disposed of in landfills, but increased environmental awareness and disposal costs are driving interest in carpet recycling here. There is a small market for collecting and downcycling synthetic carpet waste into low-value plastics. One manufacturer has resorted to shipping recovered nylon face fiber to the United States for recycling (carbon offsets are used to account for the transportation emissions). Also, wool-based carpets are more popular in Australia than in other nations, which can be composted without adding to landfill waste. With limited space and a high population density, Japan has long limited landfill disposal and currently incinerates more than 80% of its waste. But Japan is also an avid recycler, with some communities collecting as many as 44 separate waste streams. In Yokohama, Japan, residents receive a 27-page booklet on waste disposal with specific instructions for 518 items. Until recently, carpet was among the incinerated waste, but carpet manufacturers are now accepting used carpet tiles for reprocessing into new carpet. Readers should note the use of cement kilns offer a unique opportunity for recycling old carpet. Not only is the energy content recovered to fire the kiln by displacing coal, but the calcium carbonate in the carpet backing is the actual raw materials used to make Portland cement, so there is no ash. This gives a double benefit for carpet recycling via this approach. While incinerating carpets is a much better alternative to burying them in landfills, it is still a remarkable waste of the natural resources that went into their manufacture. As awareness and interest in carpet recycling spreads worldwide and the amount of landfill-diverted carpet increases, new facilities for recycling carpet will become viable in many more countries. More facilities mean the creation of more green jobs and the reduction of cost and energy associated with transporting collected carpet. CARE looks forward to increased carpet recycling and sustainability not just in the US, but around the world. It’s good to see many other countries off to a good start! On Tuesday, September 24th, CARE will be hosting a Webinar to go over the modifications to the Carpet Stewardship Plan and hear stakeholders’ input. The session will begin at 10:00 am PDT and last an hour and a half. Prior registration is not required to participate; either call 605-475-4333 and enter the access code 993348 OR go to www.readytalk.com and use the access code 4282127. If you plan to attend the Webinar, or simply want to know what modifications to the Plan have been made, please take a moment to read through the following brief summary. · CARE is currently in the process of hiring someone that will serve as Project Manager for the Carpet Stewardship Program in the state of California. The representative will be located in the state and will work to support the goals of AB 2398.
o CARE is currently in the interview process with top candidates. A decision should be made within the next 4 weeks. o Scope of responsibilities include: working with existing and new entrepreneurs, rural counties expansion and on-going support, independent auditor support, assisting in quarterly report generation, verifying valid operational permits. · CARE has had great success in the rural California counties. CARE will look to expand the number of counties from 6 to 10 in 2014. The program will add additional counties in 2015 and 2016. · CARE has introduced and approved new incentive programs that went into effect in the second quarter of 2013.
o Non-nylon Incentive: Companies that produce next stage products that use non-nylon Type 1 fiber will receive funds of $.12 per pound base don output. o Growth Bonus: CARE has set a goal for each quarter. If the goal is exceeded, CARE will pay an additional bonus to all processors based on their percentage of output. Achieving the performance target triggers the growth incentive payout of 10 cents per pound of output. o Continuation of Current Funding: CARE will continue to incorporate the current Type 1 and Type 2 funding model that has been used since beginning of program. · CARE has committed to research grants for a California University to study improvements in carpet recycling. CARE will use relationships that it has with North Carolina State and Georgia Tech to work with the California University. o An RFP is under development to solicit proposal for this initiative. · CARE is working on developing a new target for 2020. This target would exceed the previous one. · CARE has hired an experienced PET consultant to assist in finding markets and developing processes and strategies for PET material. · CARE has opened a dialog with CalRecycle and the State to enable procurement (e.g., SABRC) pull to aid in the development of market outlets. · CARE has a renewed focus in educating all stakeholders about carpet recycling and the AB 2398 program. Again, the Webinar will be happening this coming Tuesday, September 24th, at 10:00 am PDT. We hope that you will join us! Not all natural fibers are equally good for the environment. As people consider replacing traditional petrochemical fibers with naturally-derived fiber sources, it is essential that we evaluate the potential advantages and trade-offs. Most carpets sold today are manufactured using petroleum-based fibers, such as nylon, polypropylene, or polyester. While these materials are inexpensive, convenient to manufacture, and come in a large range of qualities and colors, they contribute to landfill waste unless they are recycled or incinerated. Carpets made from natural plant or animal fibers may be renewably sourced, carbon neutral, and 100% biodegradable and compostable. While cotton and wool are the most well known natural fibers, there are several alternative natural fibers currently being used in carpet. It is worthwhile to briefly review each of the available natural fiber options and identify the relevant sustainability considerations. 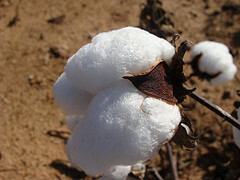 Cotton is primarily grown in China and India, although the United States is also a large producer. Cotton production relies heavily on fertilizers and pesticides, but organic farming techniques are becoming more common. Cotton has a pleasant, natural feel, but is prone to showing dirt and quickly wears down in high-traffic areas. Cotton carpeting was popular in the United States before World War II but was quickly replaced once synthetic fibers became available. Wool is collected from sheep and other animals worldwide but is primarily produced in Australia, China, the United States, and New Zealand. It is a strong and resilient fiber with natural stain-resistance. It does not give off any fumes or smells and is considered to be hypoallergenic. Wool is naturally flame retardant and has excellent thermal insulation properties. 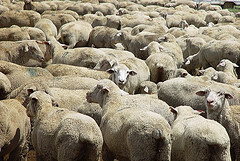 While it has long been available as a carpet in the US, wool is much more expensive than petroleum-based fibers. 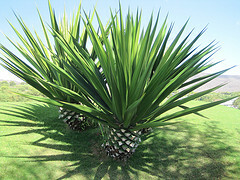 Sisal is produced from an agave-like plant that is grown in Brazil, Mexico, and parts of Africa and Asia. While sisal fibers are very durable (second only to wool), they can be stained by water and fade in sunlight. While no fertilizer is necessary for the plant to thrive, the plant only produces 200-250 commercially-useful leaves during its lifetime of 7-10 years. Because fibers only make up 4% of the leaves, a large amount of waste is leftover after extracting the fibers. Research is currently focused on developing a method for producing biofuels from the waste. Jute is harvested from the skin of the Jute plant, which is the second most commonly cultivated fiber plant after cotton. It thrives in the wet and warm monsoon climate of India and Bangladesh and can grow several feet tall in 4-6 months without the aid of fertilizers or pesticide. 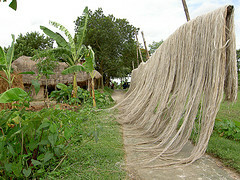 Jute fibers are soft but durable and have long been used to make burlap and twine. Jute can be used in a variety of decorative weaves and accepts most dyes readily, but is also susceptible to stains and fading. 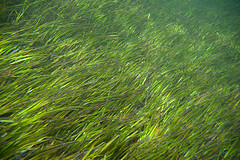 Seagrass grows underwater in tropical sea marshes, but are typically cultivated in flooded paddies in China and Vietnam that can compete with rice production. It is harvested by hand, dried, and woven in its complete form to produce a hard and durable carpet. It is commonly left undyed but can be found in a variety of neutral green hues. It retains a grassy, hay-like scent that dissipates over time. 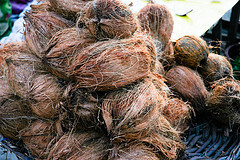 Coir fibers are short fibers harvested from coconut shells, which can range from pale, fine fibers to brown, coarse fibers depending on when the coconut is harvested. Most of the cultivated coir comes from India and Sri Lanka. Coir is durable and resistant to fungus, but is also known to cause an allergic reaction in some people. A single palm tree can produce 50-100 coconuts per year. Of the fibers that make up the outer layers of the coconut, one-third is useful coir and the rest is considered a long-lived waste product that takes 20 years to decompose. These are the most common natural alternatives used in flooring right now and as you can see they represent a range of properties and costs. It’s important to consider the impact of every step of the process when evaluating the sustainability profile of any of these natural alternatives. In other words, a life-cycle assessment (LCA) is necessary to evaluate the many options. Natural fibers that require a lot of fertilizer (made from oil) to grow, involve intensive extraction processes (energy), are transported over long distances, or displace food production diminish the benefits of a natural fiber. In addition to considering the production impacts, the potential reuse and recyclability of these natural fibers must be considered. You can see the answers are complex and not easy to sort out. That’s why synthetic fibers have grown in popularity in terms of their color pallet, local origin and costs. Recycle of post-consumer is an important approach to reducing the impact of synthetic fibers and today 25-30% of all carpets that get recycled go back into new carpets as face fiber or backing. There is another approach for an alternative fiber material: polymers made from renewable sources, such as polylactic acid. We’ll talk about these materials soon. Stay tuned! American Green Lodging and Hospitality Association (AGLHA) is a nonprofit that began in 2008 with the mission to educate and train the hospitality industry about the importance of becoming environmentally, economically, and socially sustainable. If there is one thing the lodging and hospitality industry cannot do without its carpet! Carpet provides warmth, noise attenuation, a more comfortable surface on which to stand, a color pallet and more. Accordingly, at AGLHA’s upcoming annual conference and tradeshow, to be held at the Peabody Hotel in Orlando this December 17th-18th, AGHLA is looking to feature carpet recyclers and carpet companies that make sustainable products. In addition to having information available at vendor stands, there will be a specific session within the ‘Green Interiors’ tract of the conference that will specifically address the logistics and economics of carpet recycling. The conference is being co-hosted by the Florida Caribbean Green Meeting Industry Council, NEWH Green Voice and the University of Florida TREEO Center, themselves forerunners in the sustainability movement. Not to mention, The Peabody is a hotel that prides itself at understanding the global implications of sustainability. The other two tracts at the conference will be ‘Green Meetings’ and ‘Green Lodging,’ with informational sessions ranging from ‘Marine Biology and Coastal Development’ to ‘Making Renovations More Sustainable While Controlling Costs.’ Overall, the conference has been designed with the overarching theme of Well-being, Prosperity, and Conservation in mind and attendees should expect to learn the secrets to going green accompanied by clear, feasible, examples of how helping save the environment can also boost the bottom line. As in past years the conference audience is expected to be diverse, with guests including hospitality experts, leading manufacturers, technical speakers, general managers, designers, housekeepers, engineers, sales managers, meeting planners, restaurateurs and students. An additional 300 attendees are anticipated to come just to tour the tradeshow which will feature over 100 vendors of sustainable hospitality products. For additional information including how to register to be a vendor/sponsor and/or reserve lodging please contact Peter Goren, peter.goren.aglha@gmail.com.